Regional: Salvage Vanguard Theater, the Rude Mechs, the Vortex, Paper Chairs, Teatro Vivo, Ensemble Theater. Other favorites include Dat Black Mermaid Man Lady (Pilsbury House); Pork Chop Wars, Until the Flood, and her own one-woman show black do crack (Ground Floor T heater). Education/Other: Florinda is an interdisciplinary artist whose work exists to demand community healing and social justice. She enjoys engaging audiences in explorations around identity, body, and community. 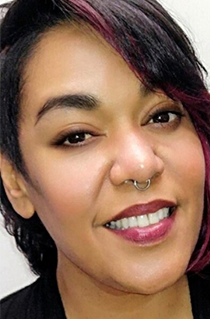 Her award-winning, one-woman show Half-Breed Southern Fried was produced as part of the Performing Blackness Series at UT and was directed by Laurie Carlos. As a facilitator and arts educator, Florinda has worked with at-risk communities, young men and women, and adults—using performance as a social justice tool for empowerment and change for over 18 years.